The construction of a sailing school for the Navy of Ecuador responded to an aspiration long cherished by many fans to the practice of sailing, official, in love the wind and the sea, but above all convinced that this type of ship would be an ideal medium for the formation of the marine in the moral and spiritual values of the naval profession. 1. The essential need for allocations from the Marina de Guerra of Ecuador formed and maintained a narrow contact with the sea; contact for unexplained reasons little by little is had been declining. 2. The convenience that the Midshipmen will visit foreign ports for this purpose was required of a ship able to worthily represent the Ecuadorian Navy. Get this type of vessel, only was possible if a suitable sailboat was built. Thus, the General Commander of marine ordered the Department IV of the greater State of the Navy the corresponding draft. Signed the Executive Decree No 250, authorising the acquisition of a sailboat of three masts for use by the Navy, the President of the Republic, major General Guillermo Rodriguez Lara, on March 1, 1974, in the courtyard of weapons of the Naval high school, as part of the official graduation ceremony. The launching of the ship took place on October 22nd, 1976, after a series of calculations and studies guaranteed by Germanischer Lloyds classifying society. They were 15 h 00 when it floated for the first time without any drawbacks to dock later on the docks of the shipyard. 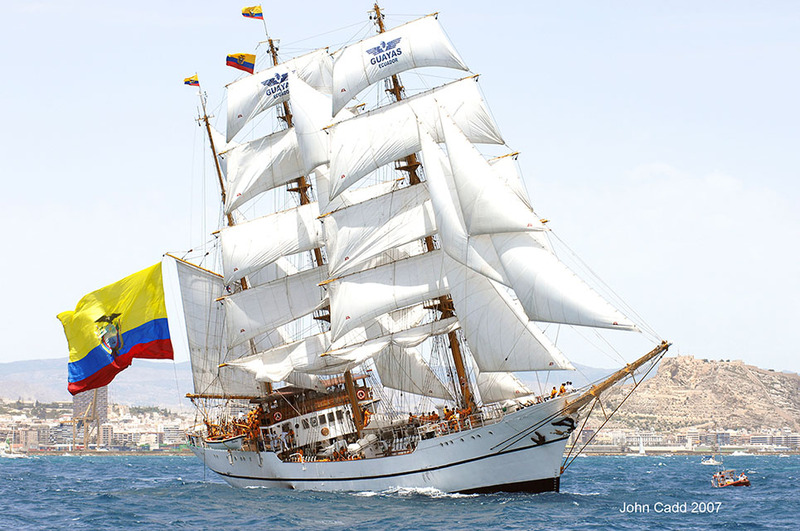 On October 1st, 1977, at 10 h 00 the school ship Guayas made her triumphal entrance to Guayaquil. 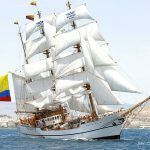 It was a memorable day for the Navy of Ecuador that the ship joined the service of the institution. Since then the school ship Guayas has flamed proudly the sacred national tricolor fulfilling their duties as Roving Ambassador of our country through the seas of the world, performing up to present 29 international cruises, when it is performing its international cruise XXIX with the first historic “return to the world of 2015-2016”, making a circumnavigation by the globe with 294 sea trips, 33000 nautical miles of navigation and visiting 23 ports international.